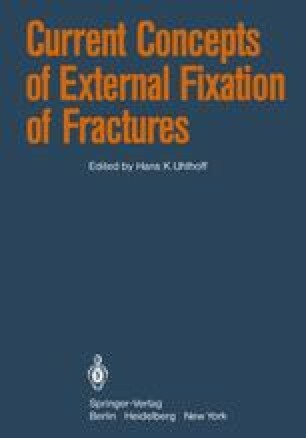 External fixation is a method for clinically problematic cases; it is not a standard method of fracture treatment (Codivilla, 1904; Hierholzer, 1978; Hoffmann, 1942; Lambotte, 1908; Wagner, 1972). In pursuit of the best program for injuries with severe bone and soft tissue damage, immobilization with a plaster cast is out of the question, and plating or nailing entails a high risk of infection. Thus, external fixation does not compete with the standard method of internal fixation but is an alternative which we need for certain special problems. It is of paramount importance to find the correct indication for each patient.